Former Chattanooga developer Franklin L. Haney has signed an agreement to hire a Canadian engineering company to perform engineering and construction work to finish at least one of the two reactors at the unfinished Bellefonte Nuclear Power Plant in Hollywood, Ala.
Haney's Nuclear Development LLC signed a letter of intent with the American subsidiary of the Montreal-based engineering firm SNC-Lavalin to complete work on Bellefonte Unit 1 once Haney completes his $111 million purchase of the idled nuclear facility, which he said he expects to buy from the Tennessee Valley Authority by November. 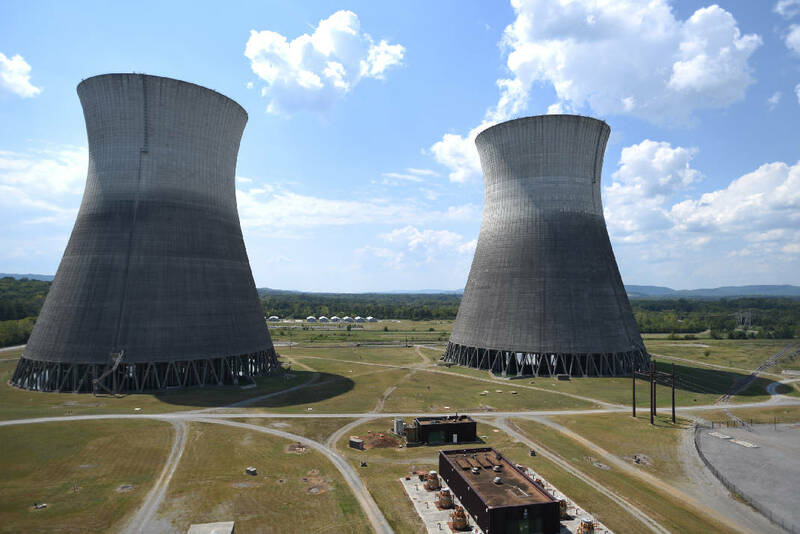 "We are excited to have been selected for this important project," said Preston Swafford, the chief nuclear officer for SNC-Lavalin who previously headed TVA's nuclear program, including Bellefonte, for seven years before leaving the federal utility in October 2013. "The impetus to complete the Bellefonte plant signifies that nuclear power has regained interest as an energy source that is necessary as part of the overall energy portfolio in the U.S."
To help finance the projected $13 billion cost of finishing Bellefonte, Haney's firm and a handful of Tennessee Valley members of Congress, including U.S. Reps. Chuck Fleischmann, R-Tenn., and Mo Brooks, R-Ala, have asked the U.S. Department of Energy to consider granting $5 billion of federal loan guarantees for the Bellefonte project. "I am always supportive of any initiative aimed at creating jobs and economic investment in our region, including the proposed completion of the Bellefonte Nuclear Power Plant," Fleischmann said. "Given the potential benefits as I understand them, I hope that the loan request receives due consideration." Brooks this spring called Bellefonte "probably the worst financial boondoggle in the history of the United States" and urged that the plant be completed, if it can be done in a safe and cost effective manner for power users in the area. "We urge you to give this project proper attention and assist in completing the review of Nuclear Development's DOE loan guarantee application, which has been pending for many months," said the letter to Trump from U.S. Reps. Fleischmann, Brooks, and three other Alabama members of Congress — Robert Aderholt, Bradley Bryne and Martha Roby. Haney, a 76-year-old former Chattanooga developer who amassed a fortune building offices, hotels and roads across the country, is trying to become the first individual in the world to own and build a nuclear power plant. Haney said earlier this year he has an agreement with prospective customers to buy the power the 1,256-megawatt Bellefonte Unit 1 would generate, and he is looking for customers to buy the electricity the second unit at Bellefonte could produce by 2023. In April, Haney reportedly met with Michael Cohen, Trump's personal lawyer whose office files were recently raided by the FBI, to help pitch to the Qatari sovereign wealth fund Haney's plan to complete the Bellefonte plant. The Wall Street Journal said Haney met with Cohen on his yacht on April 5. The two also reportedly met with Sheikh Ahmed bin Jassim bin Mohamed al-Thani, the vice chairman of the Qatar Investment Authority, to seek an investment in Bellefonte at the Four Seasons Hotel at the Surf Club near Miami Beach, just south of where Haney now lives in a former Hearst mansion on the Atlantic Ocean in Manalapan, Fla.
Haney is a member of Trump's Mar A Lago resort in Florida and Haney gave more than $1 million to Trump's inauguration, even though Haney is a life-long Democrat. Critics of Bellefonte claim Haney is trying to buy influence with the Trump administration and they question the safety and need for Bellefonte. More than a decade ago, TVA initially scrapped the plant and began tearing out some of its components for scrap metal after determining it wouldn;t need the power Bellefonte could produce and it would be too expensive to finish. TVA later reversed itself, pursued finishing Bellefonte, and then ultimately decided to sell Bellefonte in 2016 after deciding it wouldn't need the power the plant could produce anytime in the next decade or more. "We don't believe that Bellefonte could ever meet the safety standards that the NRC would require because it was put outside of the nuclear quality and assurance standards and we've seen no credible program to bring it back into those requirements," said Stephen Smith, executive director of the Southern Alliance for Clean Energy. "I am quite sure it will never be built even though Mr. Haney continues to push for some type of fantasy financing deal to still make money on this plant." "We look forward to working with local communities, unions and businesses and bringing jobs to the Bellefonte site and across North America, supporting engineering, construction and equipment manufacturing," Taylor said. "The team has performed extensive reviews of the scope of work and conducted plant walk downs to evaluate the design and equipment condition. The Bellefonte plant will bring opportunity to the Hollywood, Ala., area, creating jobs during and after construction."